Welcome to the new year ladies and gentlemen. I wish you all health and prosperity in 2012. Personally, I have never been big on new years resolutions, but since I’m writing this on the biggest football day of the year I wanted to spend some time tackling the subject (horrible pun intended). Not surprisingly, 88% of all new years resolutions end in failure [Wiseman, 2007]. I believe this to be true because year-in and year-out we bite off more than we can mentally chew. This time of year the conversation always comes up about resolutions and you’ll hear from many people they want to do this, and that, and some of this, and that one thing. If you have more than one resolution, you’re setting yourself up for major failure. The brain has a finite amount of mental energy. This is a fact. To accomplish tasks that require will power, like a new year’s resolution, you have to be economical with your brain’s energy. Try and do too much and your brain will perform poorly do to fatigue. Contrary to popular belief the human brain is not good at multitasking. In fact, it’s quite bad at it. 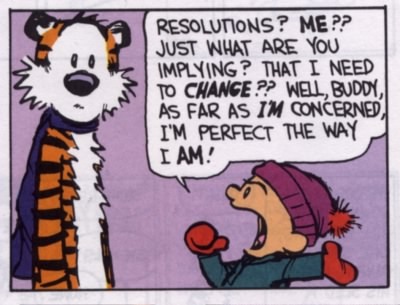 For this reason I urge you all to simplify your new year’s resolutions and pick one thing and focus on achieving it. To get in shape you need to protect your brain. Weight loss is the most common New Year’s resolution, so I wanted to spend some time on the subject . In a study conducted by Baba Shiv at Stanford University, several dozen undergrads were split into two groups. One group was given a two-digit number to memorize. The other group was given a seven-digit number to memorize. After the groups spent time memorizing their numbers they proceeded down the hall one at a time where they were presented with their choice of a bowl of fruit salad or a piece of chocolate cake. Not surprisingly the group that had to memorize the seven-digit number were 2x more likely to take a piece of cake to eat. A tired brain does not have enough mental energy to support will power – something that requires a lot of brain energy. Spending most of my life in outside sales I can say that I saw the outcome of Baba Shiv’s experiment coming. When your brain is overworked, frazzled, and stressed you make poor choices and lack will power. Like most things in life, the key to success is simplicity. Focus on doing one thing, and then do it really well. I saw this idea in action two years ago when I sat in the office of my former marketing professor and dear friend and mentor Dr. Terri Feldman Barr. She described me a movement she was starting at Miami’s Business School called “Do One Thing.” It was brilliant. Students were urged to select “one thing” they wanted to commit to and then shared it with their peers to create social accountability. Some students went as far to create badges with their “one thing” written on it and wore them for all to see. If you’re one thing was recycling then everyone knew you were going to do your best to be environmentally responsible. The end result of Do One Thing was a large group of students coming together to share their goals for better behavior and accountability. This year I ask you all to do “one thing.” My “one thing” is to compliment strangers. I want to make the environment around me better one smile at a time, and my “one thing” can help make it so.